Once contacted and an initial estimate accepted, we arrange a detailed site survey. With measurements taken, a precise CAD drawing is agreed and glass ordered. The glass is carefully checked to ensure it meets our rigorous quality control standards. A date is then set for installation of the frameless glass shower screen or enclosure by our experienced team who will see that the installation is to the high quality standards set by Showerpower™. 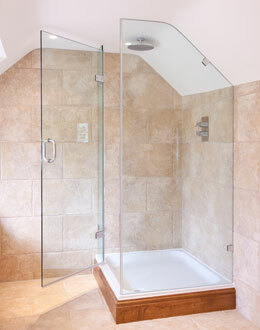 On projects involving multiple showers we will organise our team to combine our survey and installation visits wherever possible, minimising the cost to you. We fully understand the importance of working to deadlines and communicate regularly with our customers to keep them fully up to date. Some shower and bath screen manufacturers have lengthy lead-in times for their bespoke options, 4-6 weeks in many cases and, if coming from abroad, up to 12 weeks! As the installation of the made to measure frameless glass screen or enclosure is often one of the last elements of a building project to be completed, this long lead-in time can clearly cause issues with the client’s deadline. At Showerpower™ we offer a two week lead in time as the materials for our tailor-made shower and bath screens are UK sourced and the size of our company means we can be flexible when necessary. We fully appreciate the importance of meeting clients’ deadlines and have a bank of tried and tested, experienced labour to call upon when needed.